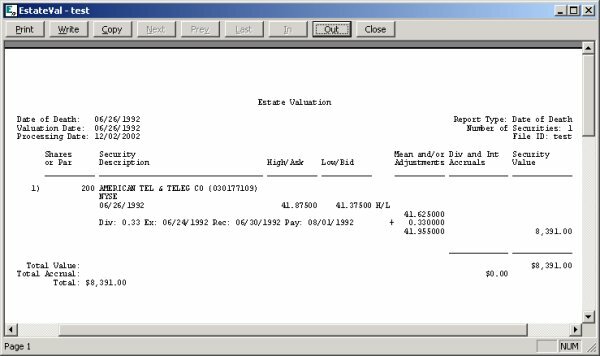 EstateVal reports dividends and makes the appropriate adjustments for stock splits as required by IRS Regulations. The following document and provide examples of these procedures. For a Date-of-Death or an Alternate Date valuation, if the valuation date is on or after the ex-date, but the dividend is not yet of record, IRS Regulation 20.2031-2i states that the amount of the dividend is added to the ex-dividend quotation in determining the fair market value. The following example demonstrates this adjustment for AT&T. Note that as specified in IRS Regulation 20.2032-1d, this dividend is not treated as an accrual and hence it is not reported on the Alternate Date valuation. 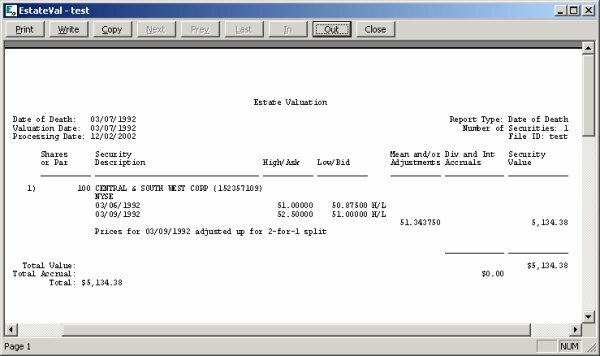 Where two pricing dates are required to calculate the mean value and the security begins trading excluding the dividend on or prior to the second pricing date, but after the first date, prices for the second pricing date must be adjusted. EstateVal makes the adjustment according to Revenue Ruling 68-610, 1968-2 CB 405. In the following example, the Date-of-Death fell on Sunday, January 13 and the actual high and low prices for Monday (1/14/91) were 94.75 and 93.625, respectively. If a dividend is of record (the record date is on or prior to the Date-of-Death) but not yet paid, the dividend is reported as an accrual. As an accrual, this dividend is also reported on the Alternate Date valuation. A number of complications can arise in the case of stock splits. The important point to remember is that reported prices adjust when the security begins trading excluding the dividend (i.e. on the ex-date). At this point the new shares begin trading. Where stock splits occur between the Date-of-Death and either the Alternate Date or the Distribution Date, EstateVal adjusts the number of shares and documents the adjustment. In the following example, Central and Southern West Corp. had a 2 for 1 split. On Monday, 3/9/92 the reported high and low prices on the new shares where 26.25 and 25.50, respectively. Prior to calculating the inversely weighted mean for a Saturday Date-of-Death, EstateVal adjusts the Monday prices. Where both stock splits and dividends are involved, the situation becomes increasingly complex. 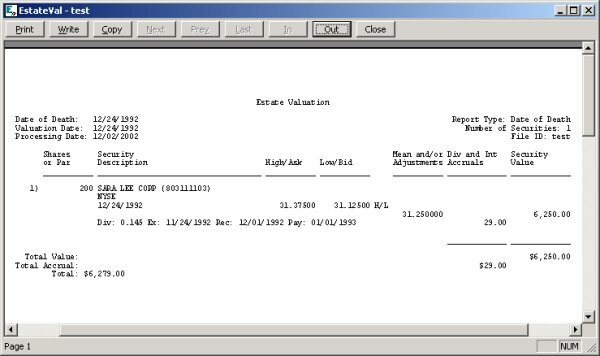 In these situations, EstateVal starts with the Date-of-Death inventory and makes adjustments for all possible situations. Sara Lee Corporation provides us with a concrete illustration. On December 22, 1992 the stock began trading new shares following a 2 for 1 split. Prior to this split, the company issued a dividend of $.145 per new share, with an ex-date of 11/24/92, a record date of 12/1/92 and a pay date of 1/1/93. In Example 5, the Date-of-Death is prior to December 22 and reported market prices are on the old shares. 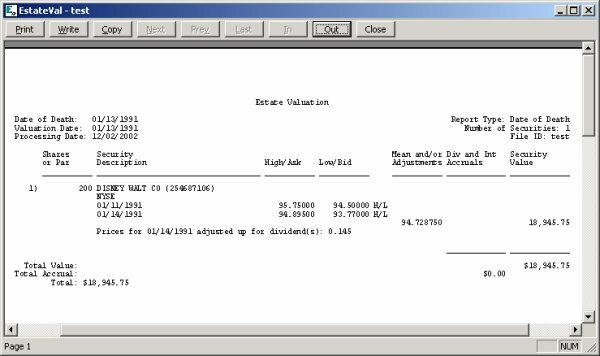 In this situation, EstateVal adjusts the dividend to $.290 per share to correlate with the Date-of-Death holdings. In example 6, the Date-of-Death is after the stock split. At this point in time, the deceased held 200 shares and EstateVal does not adjust the reported dividend.